Hello all! 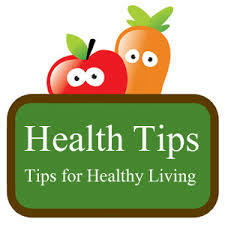 I am here again to share some health tips that may help you. Add some bell pepper to your diet as it will help your body with the digestion process and even to control cholesterol. Regular consumption of black grapes helps to improve one's concentration and memory. They will even help you boost verbal and spatial recall(spatial memory is the part of memory responsible for recording information about one's environment and its spatial orientation). Musk Melons are rich in potassium. It normalizes the heart beats and oxygenates the blood,making you calm and relaxed. It will help you fight constipation. Add a raw green mango to your diet if you suffer from acidity and chest burns. Garlic has many vitamins including vitamin C,Vitamin B6 and manganese. It can help you cure common cold faster. Blue cheese has anti-inflammatory properties. It helps to reduce joint pains and help fight arthritis. Having a simple concoction(mixture) of honey and cinnamon can help keep your breath fresh. Guava has a range of health benefits-it helps treat diarrhea,dysentery,constipation,cough,cold and even high blood pressure. Apple cider vinegar is known well to lower blood glucose and blood pressure. Have rock salt with lemon juice to alleviate stomach ache. Turmeric milk helps heal aches and pains in the body and in general boosts immunity. Oil massage helps strengthen children's bones and enhance their immunity. Ginger and honey may help you cure cough.